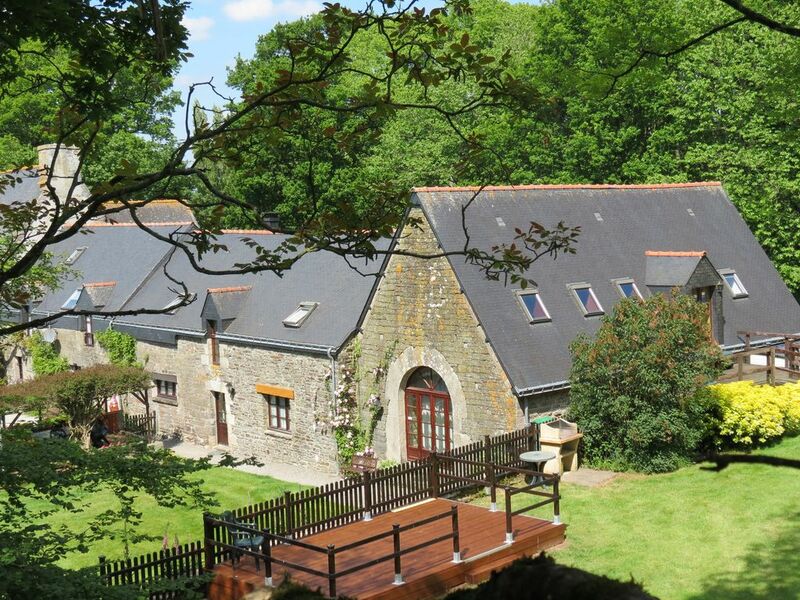 The Coach House, a fabulous conversion sleeps 6 - 8 in an unusual and exciting configuration. The main entrance is through a beautiful arched doorway into the lounge, a cool, stone-flagged area, open to the roof beams and looking out onto an enclosed lawn, ideal for toddlers. . The lounge is comfortably furnished with 2 settees and has Freeview TV and DVD. To the rear of the lounge are 2 bedrooms a double and a twin, and a shared shower room. A beautiful hand-crafted staircase leads to the upper storey mezzanine overlooking the lounge. To the front of this mezzanine there is a spacious dining/kitchen area, which opens out onto a deck overlooking the garden and swimming pool. To the rear of the dining room is the master bedroom with en-suite bathroom. A twin-bedded garret is accessed by a ladder from the dining area for the more adventurous and has 2 full-sized futon beds. It provides spacious and comfortable accommodation for a family or group holiday and can be rented with Bishop's Well and Chained Heart. Each cottage has a private BBQ area and there is plenty of space in the garden for boisterous ball games and quiet relaxation. As well as the 12 x 6 m heated pool there is a games room,swings and slide and a grassed badminton/volleyball court. For local amenities Bodion is approximately 15 mins from the historic town of Pontivy where you will find supermarkets, restaurants and shops. Plumeliau, a 5 minute drive, is our local village; a friendly place to buy bread and croissants . St Nicholas des Eaux (15 mins), a charming village on the Blavet River, offers two restaurants, creperies and bars as well as river cruises and kayaking. The 12 x 6m pool is heated from mid May to mid September and is securely fenced. Very well equipped with great facilities. The pool and garden were great for all! The owners couldn't have been more helpful and friendly. They were very welcoming of our two dogs. It worked very well having all three properties for our family group of 23 ranging from 9 months to 78 years! Our local village of Plumeliau is 4 kms away. It has 2 good supermarkets, boulangeries and banks. There is an excellant creperie/pizzeria called LA FORGE, open Sunday evenings, as well as a couple of friendly bars. Pontivy is a charming country town on the River Blavet with many beautiful half-timbered, corbelled and turreted houses, cobbled streets and attractive shops in the old quarter around the 16th century church of Notre Dame de la Joie.The 15th century Castle of the Dukes of Rohan with its two remaining towers is well-worth a visit. There is a good variety of restaurants, cafes, interesting shops and good supermarkets. Pontivy has an open-air swimming pool. Market day is Monday. There is Cycling for all stages from the gentle towpaths beside the Blavet river, through quiet country lanes and villages to the more exacting marked trails. Bicycles are available to hire locally. Fishing; all types of angling is catered for and daily or weekly permits are available. Golf. There is the 9-hole course at Bieuzy les Eaux and the 18 hole courses nearVannes , Lorient and Auray. Gokarting in Plumeliau , Auray and Lanester near Lorient.